Whistling Gardens has revealed its new peony colllections. As a “budding” new garden destination attraction located in Ontario’s Garden, Norfolk County The Heimbecker Family and Whistling Gardens Team, shared two peony collections with the general public on May 23, 2014. 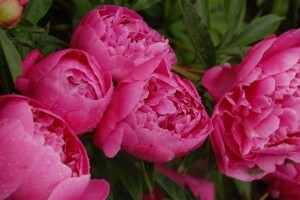 The two collections represent over 700 varieties of peonies, a “Premiere Canadian Collection” while showcasing an annual floral show of over 900 plants. Visitors are welcome to witness the transformation as two Peony Collections are introduced and planted throughout the 2014 season with full blooms expected over the next two years. The Heimbecker Family acknowledged the generosity of the two donors: Mr. & Mrs. Joe and Hazel Cook with their daughter Amy, Blossom Hill Nursery and Mr. David Maltby. The Honourable David C. Onley, Lieutenant Governor of Ontario helped open the new attraction, along with the Honourable Diane Finley, Minister of Public Works and Government Services, Toby Barrett, M.P. Haldimand-Norfolk and Norfolk County Mayor Dennis Travale. Whistling Gardens is located in one of the most agriculturally diverse areas in Canada and near one of the most ecologically significant parts of the world – a UNESCO Biosphere Reserve. This peonies donation, by two generous private citizens reveal a very substantial collection, which represents a new significant opportunity to engage the international overseas tourism markets into Norfolk County based on existing, established smaller botany collections. Unique opportunities are creating emerging new markets in agri-tourism as farms embrace transformative change through the collaboration between philanthropic donors and private business. Whistling Gardens was first envisioned over 25 years ago by owner Darren Heimbecker to be built as a sustainable agricultural public sanctuary in perpetuity, offering education, celebration and respite for garden guests. BLOSSOM HILL NURSERY, The Cook Family Joe and Hazel Cook with their daughter Amy have operated a family owned business, Blossom Hill Nursery since 1994, specializing in the hybridization and propagation of British Delphinium elatum. A second passion has resulted in an extensive peony collection of over 600 varieties including species, tree, herbaceous and intersectional peonies. Blossom Hill is located just north of Peterborough and has perennial display gardens as well as 3000 peonies and trial beds in the field for over 1500 delphiniums. Blossom Hill delphiniums have won the only two Bronze Medals from the UK Delphinium Society presented at the Ontario Delphinium Club field days. The year 2009 was very exciting for their nursery. Hazel’s entry of one of their peonies, a large double yellow intersectional, named ‘Bartzella’, won the Grand Championship at the Canadian Peony Society Convention held at the Montreal Botanical Gardens. Blossom Hill Nursery was also honoured with the ‘Outstanding Business Achievement Award’ from the Kawartha Lakes Chamber of Commerce, Eastern Region. The Cooks are active members of many horticultural organizations. David J. Maltby Peony donor, David J. Maltby is a well-respected Canadian general practice lawyer in Brantford, Ontario. As the current President of the Canadian Peony Society and Past President and current board member of the Ontario Regional Lily Society. He is the 2012 recipient of the North American Lily Society Regional (NALS) Medal, acknowledging his outstanding service to the horticulture and the Ontario Regional Lily Society. Growing accolades are numerous, Best in Show, along with many other major awards, have extended his long winning streak. His respectful peers know him best as ‘a good gardener’. He made this donation so that it would be available for the public to enjoy! The David J. Maltby Peony Collection will be proudly enjoyed by thousands of guests as a result of his generosity to donate his personal collection of approximately 300 peony plants with several one of kind cultivars and varieties to Whistling Gardens. OUT OF TOWN GUESTS – Ontario’s Garden Stay & Play Visitor Special! Savings Up To 30% Out of town guests wishing to join us this season should explore our NEW overnight special “Tussie-Mussie” The Language of Flowers. Enjoy a day in the gardens, an afternoon of shopping in Simcoe’s quaint boutiques, dine at Blue Elephant’s award winning restaurant and take comfort in a cozy overnight stay and breakfast at the Comfort Inn while experiencing our friendly home grown hospitality! Agri-tourism, a new outlook on conventional farming! The botanical gardens are ornamental in nature, however they are a primary farm resource for seed and plant propagation material. As the gardens mature each year, The Heimbeckers are getting closer to becoming self sustaining by growing a majority of the plants, especially rare and unique selections that can be offered at their retail garden centre. Now entering their third season, the botanical gardens witnessed a 32% visitor increase from last season with local garden enthusiasts, globetrotters from most of our Canadian provinces and overseas guests planning a visit. The planting continues as the wheelchair accessible gardens now represent 20 acres to accommodate their growing collections of conifers and specialty plants. Valued new partnerships continue to evolve while providing unique garden experiences for diverse groups. New horticultural, educational nature programming and the exotic bird aviary is creating a unique and diverse garden guest experience. See site Map.